It’s almost that time of the year again when we can look forward to the warm season kicking away the gloom and coldness (at least we’re getting there, here in Berlin). While many of us begin spring cleaning to organize our closets and to remove clutter, this is a friendly nudge to also give attention to your digital space – especially your email inbox! In fact, studies have found that digital clutter can hinder your productivity just like a messy office does. Just like how you should respect your physical belongings and space, cleaning and tidying up your digital space is the key to peace of mind. It’s normal to feel overwhelmed by an inbox full of unread and ‘waiting to be answered’ emails when you’re trying to give it a spring clean. So the first step is simple: start fresh. Drag and drop everything to a folder where you can then sort out the mess. That way any incoming emails during your clean up will not interrupt your process. The focus of tidying up is not to define what you want to get rid of, but what you would like to keep. First, picture your ideal inbox: what kind of emails will you be keeping, and what do you find important to you? Then, imagine the peace of mind and the relief of stress that come naturally afterwards. The ‘5-year question’ encourages you to think deeper into your relationship with emails, and the values they bring to moving forward your goals. If your answer is ‘never’, continue to lower it to ‘4 years’, ‘2 years’…until you reach a time range of emails you’re comfortable with storing, and knowing that they serve a purpose in your current work/life. The answer can be different depending the role of email in your daily job, but the next step is simple: take a bold, confident move – and delete/archive everything that is before this time range. The focus of cleaning up your inbox is not to define which emails you want to delete, but which ones you would like to keep. ‘Out of sight, out of mind’ can easily go wrong when it comes to emails. The more layered and complicated your folder system is, the more hidden spaces you are creating to bury emails you should simply delete. Chances are once you moved an email into folder, there’s a very low chance you’ll ever remember it again. Your inbox should not be the location to pile up references and documents. If there are particularly emails that need to be documented, export them to another app for storage. For example, Mailbutler offers a free plugin for Apple Mail that lets you export emails (including attachments) directly to Evernote. Check it out if you find it useful. To break down the cleaning process, you can target one or two common keywords, sender address, names… and filter them in search. This method makes sure you can go through the same type of emails in smaller batches and deal with them systematically. Simply put: most of us have no idea how many newsletters we’re subscribed to. From your most recent emails, look for a few newsletters that you have been ignoring for a while. Ask yourself the ultimate Marie Kondo question: do they spark joy? More importantly, do they offer value that works towards your goal and vision? If the answer is no, give your silent gratitude (or not, if you never asked to receive them) and unsubscribe them in batch. This feature identifies all newsletters you are subscribed to in your inbox and lets you easily opt out in one click. Unsubscribe is a free feature exclusively in Mailbutler’s extension for Apple Mail. 7. Go through your unread emails from the bottom: delete or archive those you won’t (or can’t) take action anymore. Do you want to make a change in your relationship with emails? Begin by confronting the unattended ones! The reason why we’re still keeping unread emails lingering around is simple: we don’t know what to do with them. Email struggle is real: we’ve all procrastinated on replying to an email, or panicked because we completely forgot to follow up after weeks have passed by. What we shouldn’t do is continue fostering this avoidance. Start from bottom (oldest) to the top of your unread emails. If this consists of emails you have forgotten from years ago, don’t panick – realize that it’s highly unlikely your contact is still expecting a reply at this point. Take a deep breath, remove them and let go of your email guilt! The final step to cleaning up your email inbox is to tackle the remaining read emails. Every glance at an unread email drains a bit more energy out of our day. But every glance at a read and ignored email means we are enabling the habit of letting emails to clog up our digital space. Is this an email that belongs to one of my folders, thus can be moved? Is this an email I’ve already replied to, thus can be archived/deleted? Has this email been unattended for so long that there’s no point to react now, thus can be archived/deleted? Has this email already served its purpose, thus can be archived/deleted? If the answer is ‘yes’ to all of them – go ahead and clear them out! Now that you’ve given your inbox a scrub n’ clean, the next question you might have is: what about the new emails? Am I simply going to repeat this process when the inbox number piles up to another unbearable, frustrating high? Thankfully we’re not here to offer quick and short term fixes to inbox management. In fact, the cleaning process is just half way to your success. In part 2, we’re sharing 6 effective habits that anyone can adopt today to maintain an organized inbox. Emails crave our attention with no consideration to your unique work routine. Just like every other forms of distractions, it’s important that we don’t react to incoming emails in a passive manner. One of the most important habits in maintaining a tidy inbox is to react accordingly by turning emails into actions on your to-do list. Don’t let them lay around. Instead, add these reminders to your calendar or to-do list, then archive the original email if you can. We previously shared a complete guide and workflow using Inbox Zero and Getting Things Done (GTD) strategies to help you decide what to do with each incoming email. You can download and print the flowchart out if you need additional reminder: Check it out here. Another common problem is not knowing how to prioritize on incoming emails. Setting up filter/labels can help you identify emails that should catch your eye – and attention – more than everything else. For example if you work in sales or PR, it might be a good idea to set up a list of your most important clients and contacts so that incoming emails have a different color or look. The next time you decide to give away your email address in exchange for something free, think twice about what it means. You are potentially opting in for emails that you have no time to read, and do not contribute towards your goals. Does this newsletter/email list offer something that helps me work towards my goal? Does the company/service provide something that aligns with my goal and vision? If the answer to both is ‘no’, why let their emails fill up your precious time and inbox space? Off time is off time – stop replying to your emails! Checking emails mindlessly can give us a false sense of ‘empty productivity’ and busy-ness. Instead, we encourage you to set up healthy boundaries that gives you enough freedom in managing every aspect of your work tasks. Tracking apps and tools such as Timing and Timeular can also help you understand your usage and time spent checking your emails. This great article from Ink+Volt lists out the importance of time-blocking for any kind of daily tasks. Instead of checking emails as they arrive every other minute at your door, try booking hours in your calendar to manage emails in batch. It’s also important to turn off email notifications when you’re not checking them. 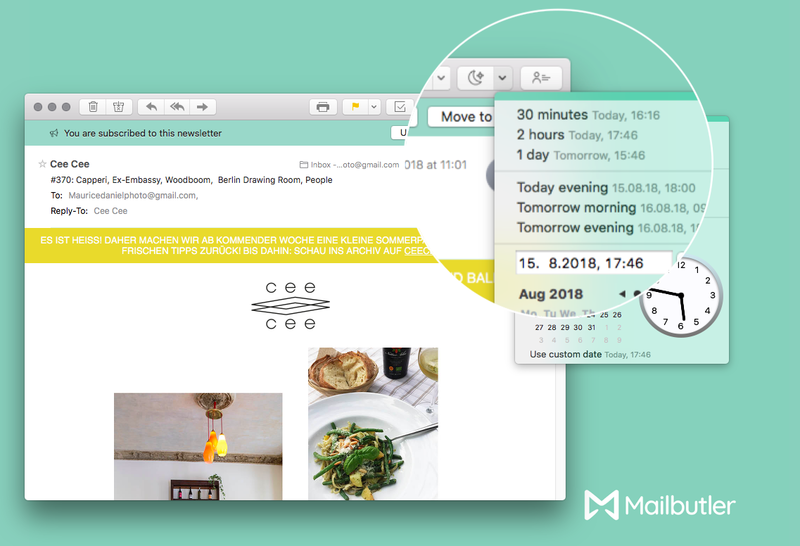 Mailbutler is a free plug-in for Apple Mail and Chrome with Gmail that lets you control when you want to send an email in the future and when to follow-up if you have not received a reply after X days. Instead of leaving an email in your inbox just to remind yourself, Mailbutler lets you smartly schedule emails at times that are the easiest for you. The follow-up feature reminds you to get back to your contacts at the perfect time. Not everyone is ready to kickstart a full-fledge GTD workflow in their busy inbox (even though we really suggest you give it a go), but there’s a general rule of thumb that you can make incredible use of right now to improve the way your emails are handled. For every incoming email, ask yourself if you can complete this under 2 minutes? If the answer is yes, complete it immediately; otherwise, put it to your task manager or snooze it for later. Snooze allows you to temporarily remove emails from your inbox until you’re ready to handle them later. You can even define working hours so that Mailbutler snoozes emails until your next working day.